Happy Friday Angelenos! Looking for Things To Do in L.A.? This weekend can be summed up in a few words: Warm. Churro. Ice Cream. Sandwich. Give that insane hoopla surrounding Ramen Burgers a run for its money because the promised land for Eastside foodies may have just arrived in the form of these squishy, sugary delights. 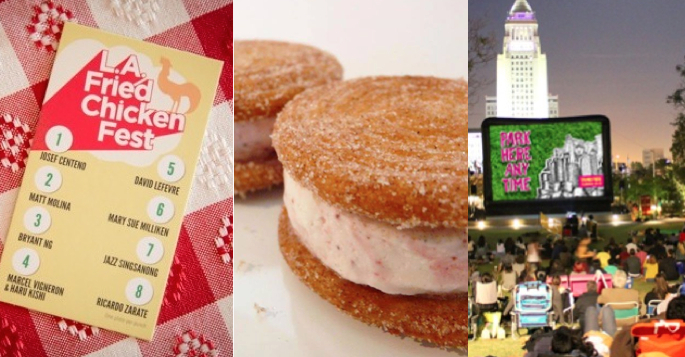 Celebrated at the L.A. Food Festival, the folks at The Churro Borough are back with their spiral, cookie-sized churro ice cream sandwiches this Saturday from 7PM-10PM in DTLA’s Mexicali Taco & Co. Like a small donut, the sweet and spongy churro is a delicate vessel for a scoop of decadent caramel peach, custard or horchata ice cream. Awesome just got awesomer! Squeezing out what might be the last few droplets of summer is Grand Park’s Movies in the Park on Saturday. Bring your picnic basket, leashed doggies and blankets for childhood favorite: E.T. – the Extra-Terrestrial — for FREE! Food trucks will be on hand from 5:30PM-10PM. On Sunday, Food GPS is inviting you to ponder another 3 words: Fried. Chicken. Festival. Is there really anything more to say? Tickets are all inclusive from $55-90 for 11 chef-prepared dishes, sides, cocktails, craft beers and desserts at Lot 613. Have a great weekend!